Gwrthefyr was King Aircol Lawhir's son. He is better known to history as Vortepor the "tyrant of the Demetians" denounced by the early 6th century monk, Gildas, in his De Excidio Britanniae. His reign was apparently dogged by invasions from the powerful King Maelgwn of Gwynedd. Gwrthefyr's memorial stone, discovered at Castell Dwyran, provides clear evidence of his historicity. 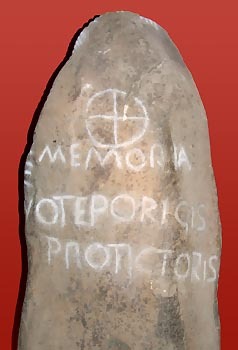 The inscription: "Memoria Voteporigis Protictoris" shows that he used the Roman title of Protector, rather than King. This has strengthens the idea that his Irish ancestors were brought into Dyfed as mercenary peacekeepers, protecting the area against attack from fellow Hibernians.